What Happened When Caitlyn Jenner Got Facial Feminization Surgery? If you are anything like me, you scratched your head when you heard mention of the term facial feminization surgery. I mean, sure, you must admit there are certain physical traits that makes a person look more masculine than feminine but you probably never thought much about it. Now that Caitlyn Jenner is dominating the headlines, we must take the time to try to understand what she has gone through. 1) She lives as a man for 65 years even though she has felt like a woman inside. 2) She married women, had children and became a household name based on her athletic abilities. 3) At 65, after a divorce to Kris Jenner, she decides that now is the time to be who she really wants to be. She has surgery and announces to the world her new name and new image which included a facial feminization surgery. According to PageSix, that new image must have cost a pretty penny. They asked Los Angeles-based celebrity plastic surgeon Dr. David Alessi for an estimate on Caitlyn’s facial feminization surgery and he said it could have run $70,000. $70,000 and none of it below her collar bone? That is amazing! But I still don’t get it. So what exactly could Caitlyn have paid $70,000 for during her facial feminization surgery? 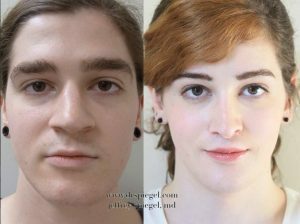 Here is an excerpt from the website of the Dr. Velargo of the New Orleans Center For Aesthetic Surgery that explains all of the options for a transgender person seeking facial feminization surgery to appear more feminine. WHAT HAPPENS DURING A FACIAL FEMINIZATION SURGERY? As a facial plastic surgeon, Dr. Velargo is keenly aware of how facial characteristics and structures are perceived as overwhelmingly “masculine” or “feminine.” These features include the prominence of the forehead and brow region, the size and shape of the nose, the fullness and size of the lips, the angle and definition of the lower jaw, the position and prominence of the cheekbones and chin, and the prominence of the Adam’s apple. Each of these areas can be addressed with specific procedures performed by Dr. Velargo, alone or in combination. Reducing the prominence of the forehead/ mid-brow region by reducing the size of the bony frontal bar (shaving and sculpting the bone). Creating more arched eyebrows with a brow lifting procedure. The brow region in a “masculine” face has a more anterior projection with a greater distance between the flatness of the forehead (frontal bone) and the prominence of the frontal bar. All procedures are performed in a manner to minimize visible scarring. This surgery is usually performed under general anesthesia; however, some procedures can be performed under local anesthesia with some oral sedation. Well. There we have it. That is a LOT of work, just to be a FABULOUS woman! Now, to master the art of makeup!